The foods that cause gout fall into five main groups. You can see what foods cause gout below, but first I need to explain some important principles to bear in mind before you study those food groups. Foods affect gout in different ways. Just like medical treatments for gout, some foods affect pain control, some foods affect uric acid levels, and some foods affect both. Before you look at what foods cause gout, you need to think about your gout treatment plan. What are you trying to achieve? Are you treating long term gout, or immediate gout pain? When you change gout diet, you expect to change your gout symptoms. But you must make sure you match the right food change with the right symptoms. This is complicated and personal. Diet changes that work for one gout sufferer might not work for you. Don’t worry. You are not alone. You should always seek the advice of your doctor, or a gout-trained nutritionist/dietician before you make diet changes. I can help you decide what questions to ask, and help you understand the responses you get. All you need to do is ask in the gout forum. I will explain what foods cause gout, in general terms. Then you can add relevant facts and important questions to your personal gout profile. Then we can work out what foods cause your gout, and work out how to avoid them so that you can control your gout. We now know there are 5 important groups of foods that cause gout. Most of my guidelines have been based on 4 groups, and so I am reorganizing my gout diet guidelines to reflect the latest science. If you see other references to 4 groups, please flag them up in the gout forum, and I will prioritize them for change. High purine foods have always been linked with causing gout. We now know that this takes many months, or years, to take effect. Purine control is still important to gout diet management. You must measure purine control by changes in uric acid over at least two weeks. Do not associate any changes in gout attack frequency with changes in purine consumption. We now know that a different food group (described below) is to blame for immediate gout flares after meals. More details about high purine foods to avoid, coming soon. Match calories to what you need to live. Excess calories easily convert to bigger sources of uric acid. However, if you are overweight, be aware of my warnings in other bad gout food, below. It is better to lose weight slowly, or take uric acid lowering medicine until you achieve a healthy weight. More details of high calorie foods that cause gout, coming soon. In the meantime, please see the high calorie gout foods to avoid archive. Excess iron is associated with gout. Iron nutrition is complicated by factors that affect the availability of iron in food. However, it is easy to check food labels and avoid products with added iron. It is also easy to arrange blood donation, which reduces the iron in your blood. It is vital that you discuss this with your doctor before making any changes. Discuss this with your doctor, and get tested. If your iron is high, seek professional treatment. Discuss high iron and gout in the forum. The revelations about Free Fatty Acids (FFAs) change the way we look at gout diet. Now we know that uric acid crystals by themselves do not cause gout attacks. FFAs trigger the inflammation process. We need both uric acid crystals and FFAs to cause a gout attack. So, avoiding high purine foods as I mentioned above, is good for longterm gout management. Immediate pain control means avoiding high FFA foods that trigger the gout attack. Gout diet management is different now. Most advice you get will be out-of-date. Even here on GoutPal, I’ve a lot of information to review and revise. More details of high FFA foods to avoid with gout, coming soon. In the meantime, please ask in the gout forum. The final food group goes beyond specific nutrients. This is more about eating habits that can make any food bad. Dehydration, and crash diets are the most common offenders. Fasting, feasting, or similar irregular eating patterns are also bad for gout. Other bad foods for gout are highly processed foods, especially those incorporating High Fructose Corn Syrup, and hydrogenated fats (also called trans-fats). More details of bad food for gout, coming soon. In the meantime, please ask in the gout forum. What Foods Cause Your Gout? These are important changes in the way we understand what foods cause gout. It is an exciting opportunity to rethink your gout diet. You can make changes that make a significant difference to your gout. But, you have to differentiate foods associated with causing gout attacks, and foods associated with causing excess uric acid. These are two separate effects of foods that cause gout. We must also consider the effects of foods that help gout. I explain those in other pages in the gout diet guidelines. Gather your gout diet facts in your personal gout profile. Then use the gout forum to clarify what foods cause Your gout. 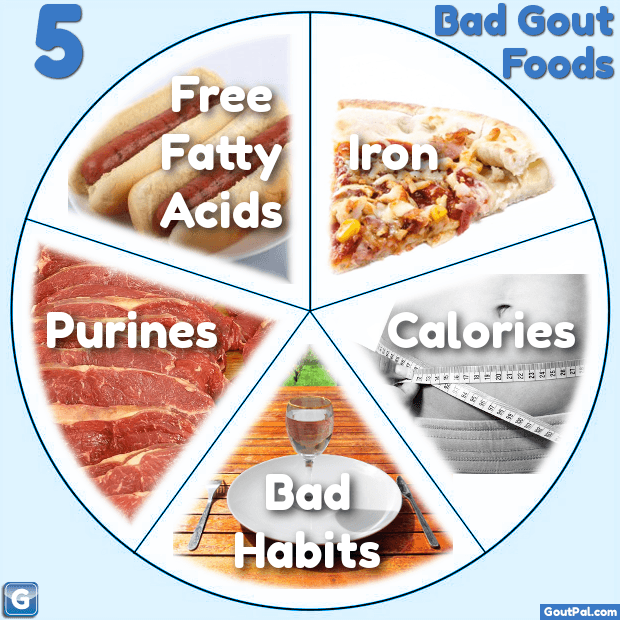 You can find facts about what foods cause gout by following the guidelines above. You should also read the updates in Avoid Bad, Gout-Causing Foods. As questions arise, add them to your personal gout profile, but also search for them in the box near the top of every page. Searching lets you find answers quickly, so I’ve added an extra search box below, just to help you find foods that cause Your gout. Leave What Foods Cause Gout to browse the Gout Diet Guidelines.